They’re everywhere. But where do they come from? Chances are there’s a plastic shopping bag full of plastic shopping bags stuffed in the cabinet under your sink. We use them to transport our groceries and take-out meals, to line small waste baskets, and even to cover our heads during an unexpected shower. The bags are certainly versatile for helping us get rid of the stuff we don’t want, like sidewalk dog poop, soiled kitty litter, and raw meat containers. But what happens when we don’t want them — where do the bags end up? Where do they come from in the first place? And how can we prevent them from polluting the oceans? Wholesalers next distribute the finished bags in bulk to major franchises, small stores, and other point-of-sale vendors who fill each one — or two, if the cashier double bags— with our latest purchases. Worldwide, people use a mind-boggling 1 trillion plastic bags — including plastic retail bags — each year, according to the US Environmental Protection Agency. US residents use more than 380 billion plastic bags and wraps yearly, the EPA reports, and only 5% of the total bags produced ever get recyled. Global Citizen campaigns on protecting the environment from hazardous waste. You can take action here. After we use them, each plastic bag faces an uncertain fate. 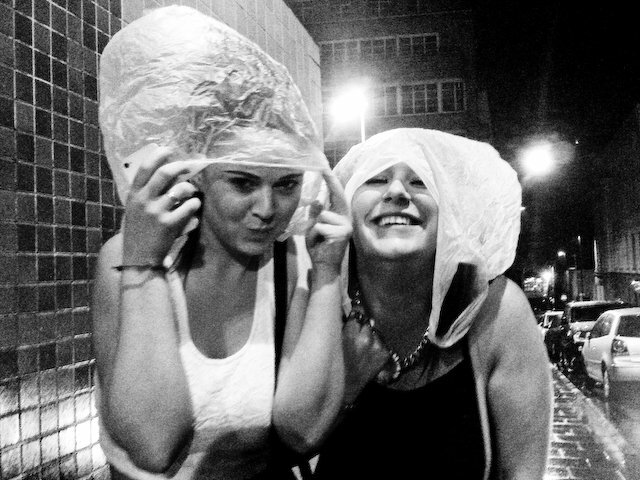 Will your bag become wadded up detritus clogging a landfill? Will it slide through the street, seal a sewer grate, and cause your street to flood? Will it billow in the breeze until it ends up as ocean waste, suffocating sea turtles? Or will the shopping bag reach a supermarket recycling bin and experience new life as a garbage can liner, a piece of sturdy outdoor furniture, or a Pinterest-worthy DIY craft? Despite their ubiquity, plastic bags make up only about 3% of total plastic use, according to the Ellen MacArthur Foundation. It’s a small percentage but still a huge volume of plastic. The thin plastic sacks with handles that you get at the supermarket checkout lane comprise just one segment of the bag industry. The familiar vessels are known as polyethylene retail shopping bags or polybags and they have a lifecycle dependent on fossil fuels. These plastic shopping bags — or polybags — begin as ethane molecules, a byproduct of natural gas production, which are heated at 1500 degrees Fahrenheit at a “cracker plant” — so-called because the intense heat forces the molecules to “crack” and form new substances, including ethylene gas. The ethylene gas is transported by pipeline to another facility, where pressure and processing turn the gas into a chain of molecules called a polymer, of which polyethylene is one type. 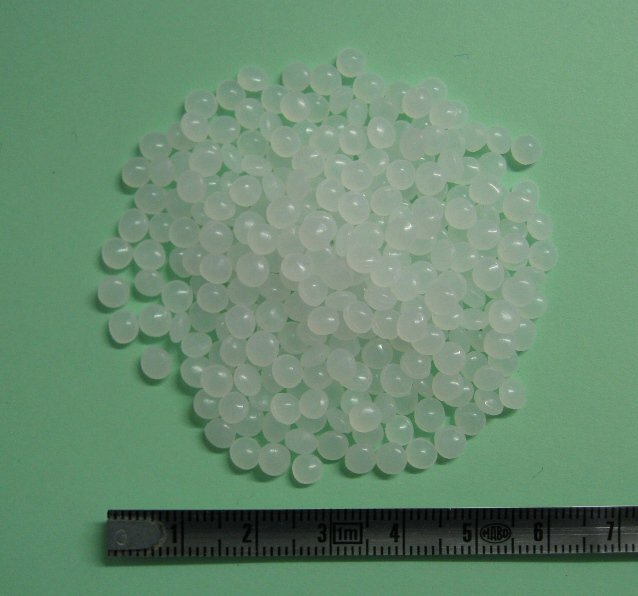 Tiny beads of polyethylene resin serve as the building blocks for plastic shopping bags. Manufacturers purchase millions of pounds of polyethylene resin each day, often from areas where oil and gas production are prevalent, like East Texas and Central Pennsylvania. When Hurricane Harvey struck the Houston area, eight manufacturers with capacity to produce about 900 million pounds of ethylene per month — 30 million pounds per day — shut down operations, the trade news agency PetroChemWire reported. Different forms of polyethylene resin currently sell for between 2 cents and 5 cents per pound. Trucks, trains, and cargo ships transport the resin to the next stage of the process, where machines called extruders reach temperatures around 500 degrees Fahrenheit and shape the plastic into a transparent, balloon-like film about 2/10,000ths of an inch wide. Next, large rollers squeeze the tube from both sides like a vice in order to flatten the film. Blades cut the film into pieces before it is rolled up and transported to the next phase of manufacturing. The finished film takes another journey, this time to manufacturers and wholesalers who shape it into bags, print logos and messages, and distribute it to an array of point-of-sale vendors. New York City’s population of more than 8 million people requires thousands of shops, take-out restaurants, fruit carts, and grocers to meet its nutritional needs. And each vendor needs a lot of bags. To serve them, dozens of shopping bag manufacturers dot the map in and around New York City, with several concentrated in northern Brooklyn. Star Poly in East New York, a neighborhood in northeast Brooklyn, is one of them. The factory employs more than twenty local workers who manufacture “many millions” of bags each year, said Marketing Director Chaya Greenfeld. Despite the quantity of bags the company produces, Star Poly is still considered a small business, Greenfeld said. Star Poly works closely with an extruding plant in New Jersey as part of what Greenfeld said is a crucial partnership in the plastic bag industry. Since each Star Poly customer needs a different kind of bag to meet safety specifications and design requests, the manufacturer and extruding company have to be flexible, Greenfeld said. Greenfeld said Star Poly serves an array of clients, from medical facilities to mom-and-pop shops, and each client has different bag durability, size, and artwork needs. 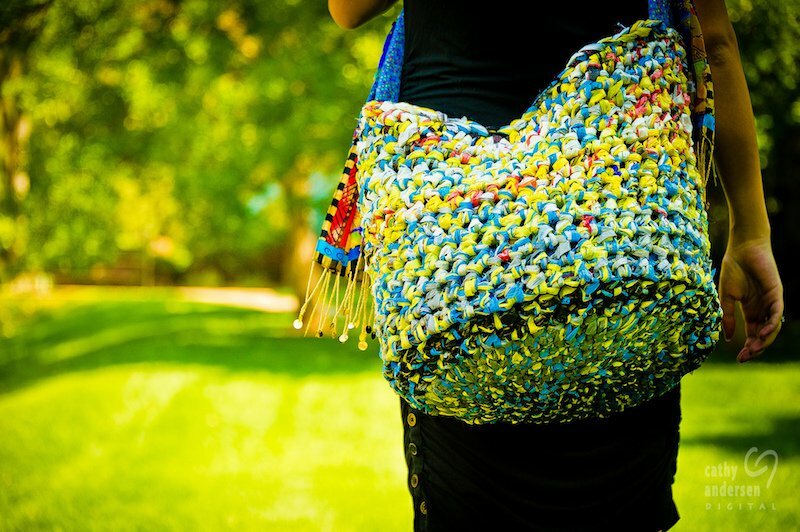 Some of the material they sell is made from recycled plastic bags, she said. But all food packaging derives from virgin plastic because of strict regulations about using recycled material to create food packaging, she said. The Food and Drug Administration prohibits the use of recycled plastics in the creation of food packaging except by companies that apply for and receive special FDA approval. Manufacturers must detail the recycling process and demonstrate how contaminants are removed. Plastic bags can’t be recycled along with commonly recycled plastic goods like soda bottles because they can jam up machinery and, remember, only 5% of bags ever get recycled anyways. Entirely separate recycling systems have been set up to deal with plastic bag waste. 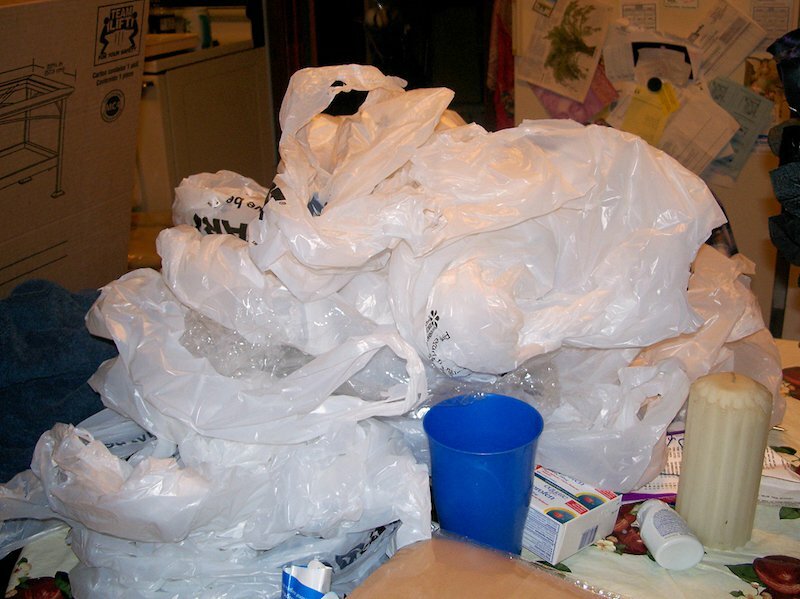 Until recently, companies struggled to recycle plastic retail bags because of one common nuisance — paper receipts. As a result, enormous batches of bags were typically discarded. Finally, Rozenski said, manufacturers figured out that they could drop huge bales of recycled bags into a vat of water to separate the paper and plastic. The waterlogged paper quickly sinks while the polyethylene conveniently floats. Free of paper, the bags are tumbled, air-dried and turn into pieces that resemble “snowflakes,” Rozenski said. The recycled material next gets melted down and repurposed. Though statistics on the percentage of bags that actually get recycled vary, gas and oil behemoths along with local governments have championed programs to promote bag recycling. 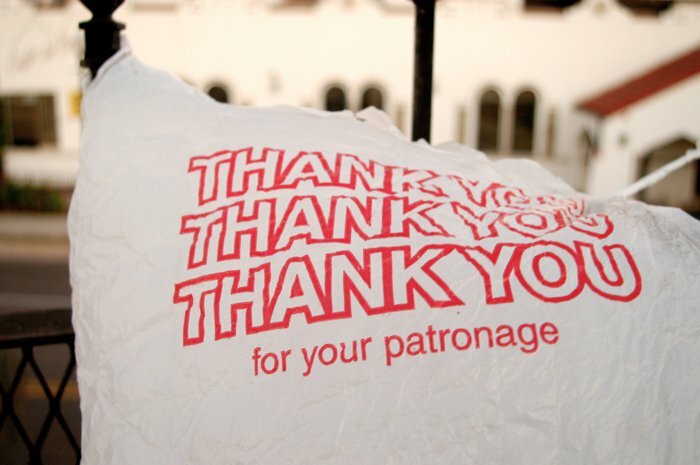 Back in New York, state law requires all chain stores and other large vendors that provide plastic carry out bags to customers to have bag-recycling containers. New York State also requires large shopping malls to establish their own bag recycling programs. The designated recycling containers help prevent the bags from entering other recycling streams, where they can cause problems. Despite the recycling gains, major manufacturers have invested nearly $200 billion in new cracker plants, which create the building blocks of plastic. The demand for plastic continues to increase, especially in India and China, Bloomberg reports and experts predict that plastic production will increase by 40% over the next decade. “Under our current view we continue to see year over year global demand growth in the film and sheet category globally,” Joel Morales Jr, Executive Director of Polyolefins Americas at IHS Markit Inc., which analyzes plastic market trends, told Bloomberg. The vast majority of existing and new plastic bags will end up in landfills, scattered throughout land ecosystems, and in the world's lakes, rivers, and oceans, causing direct harm to wildlife. Awareness of plastic waste in marine environments has skyrocketed in recent years as the problem has come into sharper focus. around 8 million tons of plastic waste enter the oceans each year, which is like dumping a garbage truck full of plastic into them every minute. That means that despite current efforts to reduce plastic use and recycle bags, existing plastic waste problems will only get worse without drastic action. “Bringing your fish home in a plastic bag one year and bringing that plastic bag home in a fish the next, is the reality,” said Karmenu Vella, a commissioner at the Ellen MacArthur Foundation. In fits and starts, the plastic status quo is being challenged. In Bhutan, The Department of Roads began recycling bags and other plastic items to pave roads. In Canada, manufacturers turn recycled bags into outdoor furniture and boardwalks. And Taiwan enacted a ban on plastic bags, along with other types of plastic. As with all materials, reducing consumption is the best way to ensure fewer bags end up as hazardous waste, environmental leaders say. But reducing individual consumption can be a challenge because plastic shopping bags are so cheap and convenient. You can get a pack of 900 on Amazon for $17.66 — just 2 cents a bag. Or you can order 1 million bags for about $77,000 — that’s 2,000 cases of 500 bags — from a wholesaler. Thus, in many cases, governments have created laws to encourage behavior change. In the UK, for example, plastic bag usage dropped significantly after the country introduced a small tax on each new bag.